Are these still the best macarons in New York? Though DessertBuzz missed the opening of LaDuree on the Upper East side today (links to reports below if you’r e interested). I recommend not reading about it and just going over and checking it out first hand. 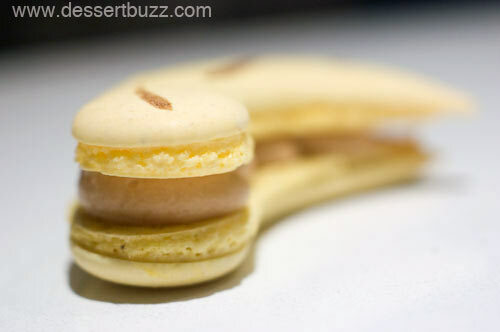 Here’s my big question: Will LaDuree’s macarons be as good as those from Bisou Ciao? After all, the LaDuree macarons have to fly all the way from France every day in cargo (mon dieu!). If you’ve tried both already let me know how they compare in the comments! DessertTruck Works monkey finger macaron - would LaDuree approve? Coverage of the opening of LaDuree. 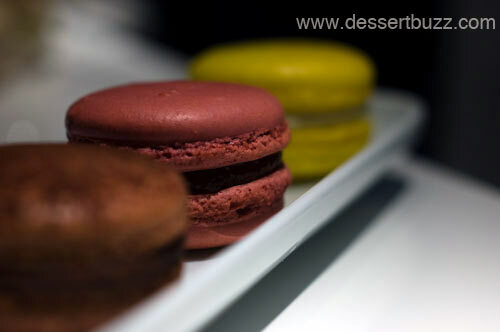 Bisou Ciao makes pretty good macarons, though I can’t say I’m a fan of DessertWorks’ macarons. Thanks Esther. We’ll both have to check back in when we have gone to the Madison Ave store! Ok, let me be clear… LaDuree can _____ a ________. Know what I mean? FN: When someone says “let me be clear” they usually follow that statement up with something clear. What is this Mad Dessert Libs? Choose your words carefully here FN you have serious credibility in this space given your frequent travels to France. No fooling around–this IS SERIOUS MAN! I’ll try and go soon, but I’m generally not a fan of getting swept up in hype and long lines. I’ll be extra interested when they open a cafe space with a wider selection in Soho. I have no credibility but if I did, I would say: I’ve been in Paris for three years and I went to LaDuree once for breakfast and never went back. There are like 23,000 better places. As far as macarons, I don’t like em in general but folks tell me depending upon the flavor (like Rose) they’d go to LaDuree but for chocolate they’d go to Pierre Herme. To spend airplane fuel to fly em from Paris to NY? Lame. Figure out how to make them in NY or don’t open the store. I simply cannot decide between the two as I like both Bisou Ciao & Laduree. A wonderful job. Super helpful inmiofatron.